There are cookbooks you only cook from and cookbooks you both cook from and actually read. 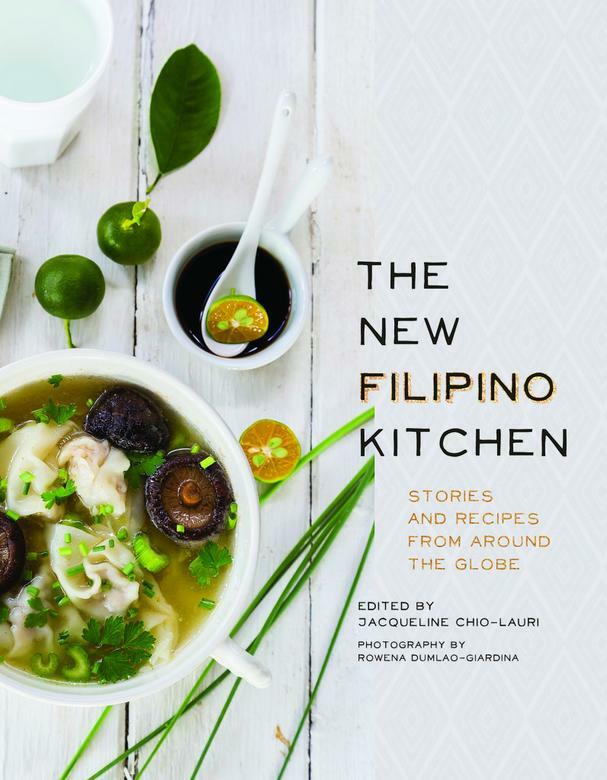 The New Filipino Kitchen, a culinary anthology edited by Jacqueline Chio-Lauri, falls into the latter category with engrossing stories and delicious recipes from Filipinos (some chefs, some not) around the world. The powerful food stories within range from heartbreaking separation and abandonment to finding love and acceptance and so much more. Before their untimely deaths, food critic Jonathan Gold claimed that "the time for Filipino cuisine is now," and Anthony Bourdain had said he expected Filipino cuisine to "explode" in America. So what is Filipino cuisine? In some ways it defies definition. Its indigenous dishes (sinigang (recipe below), adobo, lumpia, to name a few) meld together influences from across Asia all the way to Spain, and as Filipinos left the islands to make new homes around the world, their food has adapted to new flavors and ingredients, making it a highly-adaptable cuisine. For this reason, Chio-Lauri chose to highlight the recipes and stories of the book's 30 contributors in order to provide a better understanding of the history, traditions, and culture of the Filipino people. Chio-Lauri says the recipes in the book are "developed with you in mind - an open-minded person, who, every now and then, is in search of heightened food experiences." If this speaks to you, then this is the book for you! In The Making of Lumpia, chef and food truck owner Alexa Alfaro worries how she can tell her father she was quitting school to start a food truck without breaking his heart (or worse, killing her!). So she tries the same tactic her father used decades ago to win her mother's heart and also shares her Pork and Vegetable Egg Rolls recipe. Melissa Sipin, a social action and creative writing instructor, tells the tender and heartbreaking story of being abandoned by her biological mother at a young age and raised by her grandmother (lola) who teaches her everything, except how to cook. From fractured memories from her father and a deep longing for her grandmother, she found the will to recreate her lola's Baked Chicken Adobo Infused with Coconut Milk recipe. In A Plain Bowl of Noodles, Saudi-raised New Yorker Paolo Espanola believes that food can be used to solve most of the world's problems and muses over a bowl of Pansit Molo: Meat and Shrimp Dumpling Soup with Shiitake Mushrooms. Jacqueline Chio-Lauri, the editor of The New Filipino Kitchen, shares the story of her 20-something self compulsively looking for Mr. Right while admitting she hated being around couples. After two failed engagements, she heads to Dubia to manage a high-end restaurant catering to couples. In time, she learns to combat her fear of inadequacy and to hold her head high as a single Asian woman in the Middle East. Through this self-acceptance and bravery, she finds the man of her dreams. 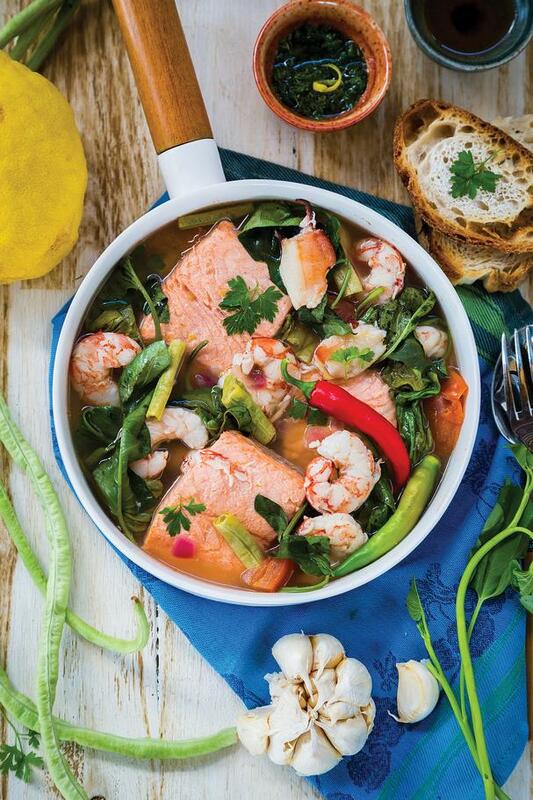 Get the recipe for her Seafood Sinigang: Sour and Savory Seafood Soup Seasoned with Gremolata below. Make the gremolata: In a 3-quart saucepan, heat the olive oil over medium heat until it shimmers. Add the garlic and cook until it is light golden, then immediately remove the pot from the heat. Transfer the garlic mixture to a bowl and let it cool for 1 minute. Mix with the parsley and lemon zest. Set it aside. Make the sinigang: Pour the seafood stock into the same saucepan used to fry the garlic. Add the lemon juice and sugar and bring the mixture to a boil over medium heat. Add the onions and tomatoes. Cover the pan, reduce the heat to low, and simmer for 5 minutes, or until the onions are translucent and the tomatoes are mushy. Put the fish in a strainer or colander and dunk it into the simmering broth. Cook for 3 to 5 minutes, until opaque throughout. Be careful not to overcook it. Immediately transfer the fish to a plate and set it aside. Put the beans in the strainer and dunk it into the simmering broth. Cook for about 5 minutes, or until the beans are tender but still vibrant green. Transfer the beans to a plate and set it aside. Put the chiles and water spinach in the strainer and dunk it into the simmering broth. Cook for about a minute, or until they are tender but still vibrant in color. Transfer the chiles and spinach to a plate and set it aside. While the broth continues to simmer, taste and add fish sauce and more lemon juice as needed. Distribute and arrange the fish, shellfish, and vegetables into each of four bowls. Remove the broth from the heat and ladle it into the bowls with the seafood and vegetables. Sprinkle each serving with the gremolata. Serve the soup piping hot, with rice or crusty bread.